I just finished making this pair of Puppet Show shorts for S. In past summers she has lived in this style, and I suspect she’ll be doing the same this year. They’re very comfortable with an elastic waistband and fullness that gets gathered into bias binding at the leg opening. But my favorite part is the pockets, which are applied near where the side seam would be. (The shorts don’t have a side seam which makes them even faster to sew up.) 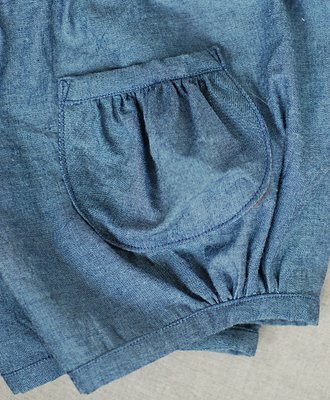 The pockets are fun and easy to make and look more impressive than their actual difficulty. I used a lightweight denim for this pair, but I used the wrong side of the fabric so it looks like chambray. I’ve got a thing for chambray; it looks a little dressier than denim. But I know that because of the durability of the denim these shorts will last through a summer of sandboxes, slides and bike riding. 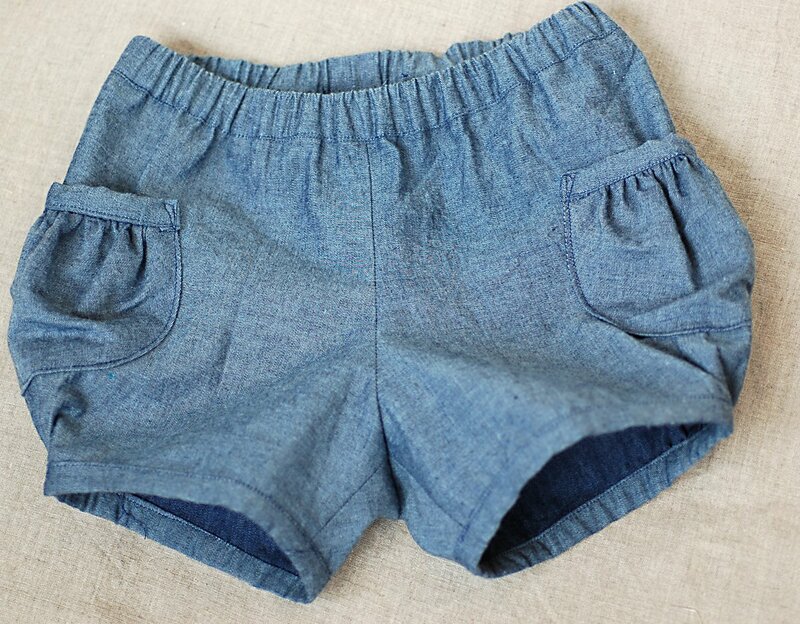 I’d enjoy seeing a picture of these on your little ‘S’… I’m curious as to how long they should look/be – if I need to adjust the length for my tall skinny one. April, I’ll absolutely post a photo of these as soon as we get some decent weather. I think the next time I make them I’ll add some length–she’s still wearing a size 3 although she’s very tall, so the extra length would be good on her. I think that, ideally, they should hit at about mid-thigh. those are great, I’m going to definitely make some for my daughter this spring/summer. Those are darling, I adore the pocket. I’m anxious to try these out this year, I am slowly replacing all of her store-bought playclothes with things I’ve made. Adding a cute and unique pair of shorts to her selection will be great. After seeing your post, I went out and bought this pattern this week, can’t wait to get started!! I love the style of these shorts and how versitile it is with different fabrics! !